Susan Crawford's latest publication, Coronation Knits, is a real gem of a book. There are many little details that catch the eye, like the crowns on the page numbers or the co-ordinated backdrop depicting the streets of 1950's London. As you flick through the book, it becomes abundantly clear that the attention to detail is second to none. And not just in the layout and presentation, either. Within the designs you'll find something to please, and naturally, I'm drawn towards the Hats! Having known Susan for some time, both as a friend and work colleague, I was more than happy to be part of the blog tour, and I hope you'll find that the questions offer some insight not only into Susan's design process, but also into the world of self-publishing. Y'all know self publishing is an important subject around here, and given the chance, I love to ask fellow designers their thoughts on the process and how it works for them. Before diving in; do you recognise the model in the photographs below? The model is Charlie, Susan's lovely daughter, who also modelled for many of the Hats in Classic Woolly Toppers, and even graces the cover (of both books, I should add) I think this just goes to show not only how adaptable Charlie is as a model, but also the strength of Susan's styling and vision. If there's one thing that I admire about Susan above everything else, it's her vision: the way she styles her models, plans her photoshoots, manages the lighting - everything - right down to the very last detail, is deliberate. Whereas I like to play with the incidental, Susan works in an opposite fashion, and I can't help but envy her ability to see life, and her work, through a very different lens. 1) Can you tell me what it is about this subject that drew you to design a whole collection around it? We know you as a vintage knitwear expert, yet this is a particularly distinct period. How did the theme develop? There were a number of strands that all came together in this project and sort of made it inevitable. In my rather large archive of vintage patterns, books, memorabilia etc., I have quite a number of newspapers, books, cuttings and more about this particular period in British history and longed to find a way to make use of it. Also after working on A Stitch in Time volume 2 for over two years, I had only done a limited amount of designing during that period, and needed a project that would direct me, so I went back to the idea of a brief which I had to follow and gave myself very strict boundaries with regards to colours, number of projects etc. And from these restrictions emerged a very clear theme. Not just the very specific period but also the red, white and blue theme and the idea of the single, black and white background for all the photographs. I find it amazing how quickly the collection all came together once the guidelines were in place and I think it was what I really needed creatively otherwise I would probably still be designing more garments for the collection and never reaching the point of a finished book! 2) You're renowned as a self publisher, owning and managing Arbour House Publishing - can you tell us more about why this works for you, and what you find to be the greatest drawbacks? I am without doubt a total control freak. The designs for me don’t exist alone. Part of the design process is the styling, the back story, the history and of course the photography and probably most importantly, the book design. By self publishing my designs I am able to have artistic control of all these elements and to be able to create a finished product that I am, hopefully, 100% happy with. Some of the projects that I have embarked upon are also not what would be considered commercially viable in the publishing world. The two volumes of A Stitch in Time have each cost a lot of time and money to create. The graphic design hours alone would be seen as totally unrealistic and therefore the original black and white patterns would not have been included losing a large part of what makes these books so very special. The only way these books have been able to work in a commercial market place is that there is no third party ie. the publisher. I have been able to set the price of the books to ensure in the long run, some sort of viable return for myself otherwise I wouldn’t be able to exist. On the flip side of this, one of the greatest drawbacks is money. My husband and I both work full time in our business and have no other income other than the business. In a nutshell this means that we self finance the printing of the books which is a huge, scary commitment. If a project doesn’t work financially its our money we’ve lost. The publishing industry works with very long periods of grace before distributors and wholesalers pay for stock they have sold which can also be very tricky. As we are the publishers as well as the creative team our roles incorporate design, invoicing, sales, despatch, customer service, stock control, accounts, marketing, PR and much much more. This means a vast amount of any working week is spent on non-design related tasks. Having so many hats usually means working very long hours and rarely having ‘weekends’. I can often go several weeks without designing or knitting anything! All in all though I do this because I want to and because I love it regardless of the drawbacks. There are parts of my life that I wish were different or easier, but only so that I continue designing and creating books. 3) Naturally, I want to talk about Hats! Can you talk us through the two Hats included in this collection? The very first pattern in the collection was Blue Riband. This was based on a highly ‘constructed’ hat from the early 1950s. Its interesting that we’ve both been drawn to looking at hats that have to be manipulated after the knitting is completed to create its shape and its fit. I’m obviously thinking of Imagiro here. Blue Riband is knitted in the round from the brim upwards with short rows worked across the back of the hat to provide extra depth for the tucks which are added after knitting. I experimented endlessly trying to get tucks that would sit upwards rather than downwards which could be performed during the knitting process and just couldn’t get them to work successfully so in the end accepted that creating the folds afterwards was the correct construction method to use. I really like using short rows to create back depth in hats. I also used it in Evangeline. It enables the hat to sit low at the back of the neck without it being equally low over the face. Blue Riband is designed to sit on the back of the head rather than flat on the top of the head. This style of hat was particularly popular in the 1950s so that curls around the face weren’t flattened by your hat and at the same time hair styles at this time often had a flat crown which allowed hats to fit well to the head. To help hold the tucks in place I added ribbon to the inside of the hat. This also provides structure to the hat and prevents the tucks from collapsing into the back neck of the wearer. So all in all edging towards millinery techniques in its construction which really appeals to me and something which I would like to explore a lot more. Crowning Glory is a very simple beret construction, again knitted in the round from the bottom up. Many patterns for hats of this period are often knitted in separate ‘wedges’ which are then sewn together. I struggle to understand the reason behind this I have to say. Even if only straight needles were commonly available - which was often the case - the hats could still have been knitted in one piece with just a single seam at the back. So on this occasion this is actually a vintage technique that I don’t prefer! Going back to Crowning Glory, I found a chart for a lace crown done in rows in a Sharon Miller book and immediately knew that I had to do something that incorporated a lace crown. The beret shape lent itself perfectly to the lace pattern, with one pattern repeat in each of the four wedges. Because of the straightforward construction its a great pattern for learning to knit a lace pattern as there is very little to worry about other than the stitch placement. It was one of those designs that seemed to come together effortlessly and I also really enjoyed knitting it. Its one design that I will probably knit numerous times. 4) When designing these patterns, what properties in the yarn do you look for? Excelana is your own yarn range, how does that fit with this collection? I love the properties of wool. I like yarns that have stretch and recovery, that are strong but soft, that work well for textured stitches and for colour work and wool tends to fit the bill every time! Several of the garments in the collection use negative ease, which means the finished size of the garment is intended to be smaller than the wearer and therefore stretches over the body to show the pattern and to create shape. If the yarn used doesn’t have both stretch and recovery the design basically won’t work. When I developed Excelana I wanted to ensure that it incorporated all the elements I’ve mentioned above and it does. It works beautifully on textured stitch patterns, stocking stitch, ribbed patterns and colour work. It also holds its shape well and has incredible stretch. I was lucky that of the eight colours I had created for the range I had a blue, a red and a natural, each of which has been used in the collection - for the Princess Twinset. I do also work with other yarns and often wool mixes when more drape is required for a design but at the end of the day if I have the choice I’ll always pick wool! Thank you Susan for taking the time to answer all these questions, and I hope everyone reading has enjoyed them too. 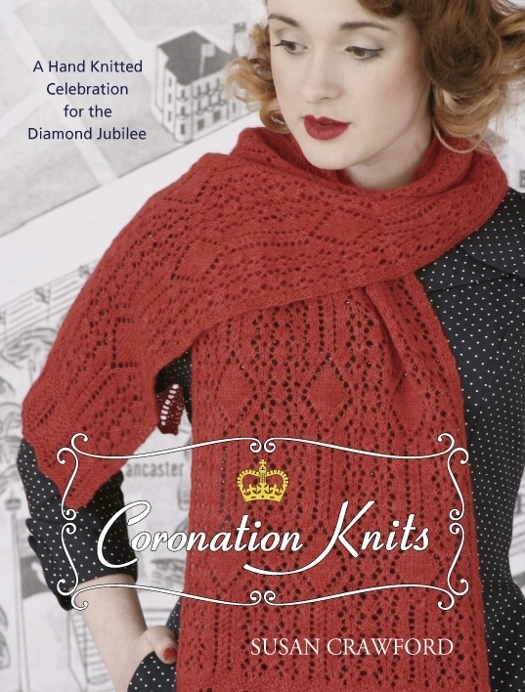 You can get your own copy of Coronation Knits from Knit on the net Shop. Susan has also graciously offered a copy of Coronation Knits for one lucky commenter! To enter yourself into the draw, simply leave a comment here telling me what this book would mean to you. What would you knit first? How does this book inspire you? One lucky commenter will be selected on the 26th July, and don't forget to leave your email addy in the email addy field (which will be private) so that I can contact you. 18th July 2012 Woolly just right here!